Miniature moist and delicate cakes with fruit filled buttercreams, jams, and homemade lemon curd. 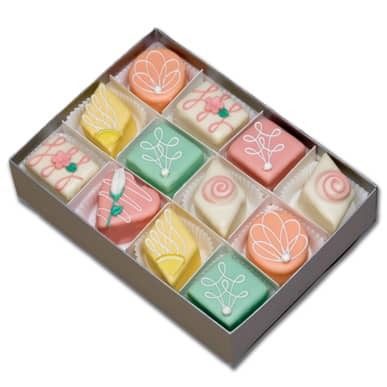 Our petit fours are tiny cakes layered with buttercream and covered with rolled fondant. Delicate pastel chocolates, fruit filled buttercreams, jams, and homemade lemon curd flavor these moist and delicate cakes. This assortment of our most requested petits fours includes: Plum Squares, White Chocolate, Strawberry Hearts, Grand Orange, Luscious Lemon, and Raspberry Blanc. These petits fours make great appetizers or desserts at dinner parties. Our petit fours go great with tea or coffee.